BA in Athletic Training and Business Administration With over 20 years of experience in the health and fitness industry, Steve has guided hundreds of clients to reach and exceed their fitness goals and objectives. 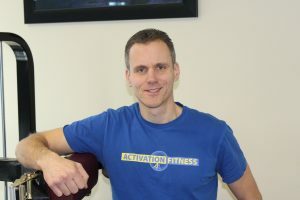 He has done this by being a true student of the human body and helping people believe in their own ability to take control of their health and make positive lifestyle changes.. With a solid background in Athletic Training, Orthopedics and MAT, he has fully dedicated his life to helping people overcome their physical obstacles in order to live a stronger and more active lifestyle. Steve shares his love for fitness with his wife, who is a competitive distance runner still in her 40’s and works on maintaining her strength as well. He has been blessed with 3 healthy kids that keep them plenty busy!